Description : Magnificent mountains covered with thick rain forest, lush plantation, wild nature and friendly people from different ethnic minority groups with their colorful and fantastic culture and custom… That is all this untouched area offers. However, this trip is for those who are brave and ready to sacrifice time, energy and city modern facilities… to the exploring wild nature as well as discovering diversified culture of the ethnic minority peoples. 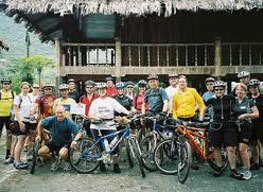 Basically use vehicle for the whole trip but walking and trekking is quite regularly and flexible for your decision. 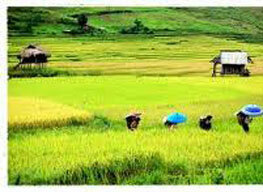 Accommodation for the whole trip is in standard hotels guesthouses and village home stay. 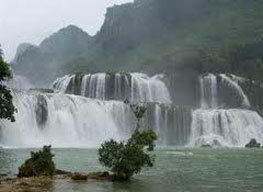 Departing from Hanoi, we cross the western edge of the Red River Delta with lively scenery of the countryside. After 70 km, the road gradually ascends uphill through the region of the Muong ethnic and suddenly it goes up steep mountains and view of the lush valley opens wider and wider. We stop for admiring the marvelous panorama scenery before descending to the valley and arrive in a large village of the Thai ethnic group. 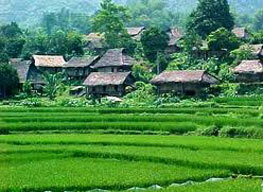 It is well organized and prosperous village as many others in the region with wooden houses on stilts standing in lines. All the houses are spacious with palm leaf roof and bamboo slat floor, the kitchen is set at one end of the house. Most interesting of all is the overnight stay in a villager's house, attending the traditional dance performed by the Thai people, a truly remarkable and unforgettable event. Today you will explore an untouched area. After Breakfast, you will leave Ban Lac of the Thai for a short drive for about half an hour. The trek takes about 4 hours up and down hill and then pass through a prosperous valley inhabited by Thai and H’mong ethnic. 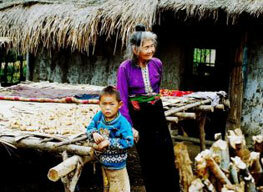 In Hang Kia and Cun Pheo villages you have chances to visit H’mong families those just started to settle for few years after practicing slash and burn agriculture for generations. Later the path gradually getting to the lower land as you approach to the Da River. Here, boarding a boat and cruise upstream the river for over 3 hours to explore wild life and meet Muong people who earn a living by fishing around this area of the Reservoir. 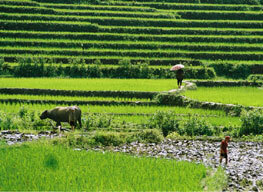 Arriving at Suoi Lon Village of the Muong in the afternoon, you will join the local’s work for your experience of local life. Home stay in the village. Enjoy a morning short walk out of the Mount village and our jeep and driver will pick us up for a two hours transfer through beautiful area with rich farmland covered by tea plantations, fancy some side visit to ethnic villages along the way and seeing tea processing. We have long break at noon in a little pretty town Ta Sua, a local center where we have Lunch and walk around the market which is colorful with local farming produces as will as minority handicrafts. 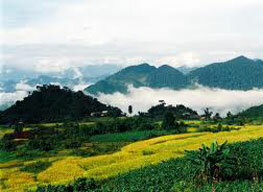 Later we take a walk for about 5 km along a track passing villages of Thai and Muong, tea farms, fantastic scenery. Visiting some local homes and tasting local wine which is fermented in pottery jar. 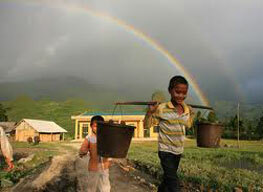 Arriving in Thu Cuc where we stay overnight in another Muong Village. The terrain changes today as we drive to Nghia Lo, Starting from Thu Cuc, featuring with fertile hilly area covered with green tea plantations, the mountains get higher and higher. Along the way you can see thick forests cover high mountains. Spending about 4 hours walking through a narrow and long valley, we meet three tribal setting their villages in different ways which reveal their traditional customs and living style: The Thai occupy the low land almost at bottom of valleys, near river or streams from which they build up water wheels for transfer water to rice paddies on which they farm wet rice intensively. 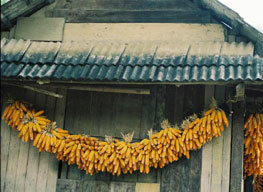 The H’mong settle at the highest elevation, grow corn and dry rice on the burn-over land and the Zao live in the middle practice both methods of farming and it is easily to realize that they learn a lot of farming technique from the Thai. Arriving in Nghia Lo, a pretty mountainous town, we spend the remaining hours of the day wandering the town including the market area. It is not far from Nghia Lo to Tu Le. The road ride today takes only 2 hours so we have a lot of time exploring the area for real mountainous life of the local ethnic minority people. Fancy a four hour trekking along a trail which connect villages to villages, meeting different tribal people such as White Thai, Black Zao, Red H’mong…who seem very surprise, staring at you for the first moment and turn out very friendly and inviting you to their homes in which you will be hosted with tea or home made wine. 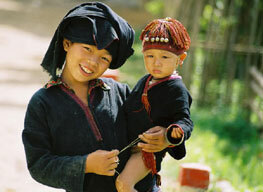 We enjoy another home staying in a large Thai village, which offers fantastic hours for your culture discovery. We are heading uphill to Hoang Lien Son range of mountains, the roof of Indochina, for our discovery from the back side of this famous area. The Northeast of this range, consider the front side with Sa Pa has been known and become popular tourist destination for almost 2 decades but the back side is staying unknown to many, even local travelers talking of the area which we are going today as of another world. The first tip of the day is the morning market at the center of Tu Le. Tribal peoples from remotest villages in their traditional costumes which are very different from one another go to market with cheerful faces…which makes you surprise! 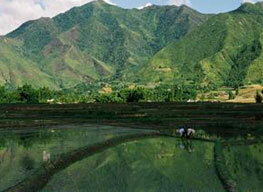 Leaving the market for a short drive, you will find yourselves in the magnificent area of this unspoiled area, Kau Pha. From the foot of this mountain pass, we challenge a 9 km trek through thick jungle up to the top of the pass which is at 1,800m above sea level. Enjoy fresh air and great view. After Lunch in Mu Cang Chai town, we continue our drive uphill which offers even more spectacular scenery, far away from what you expect! Arriving in Than Uyen town late in the afternoon, check in and relax in the only local guesthouse. We slowly drive along the foot of Fansipan, admiring its magnificence and beauty from the west side which is often clearer in comparison with that from Sa Pa at the east side. 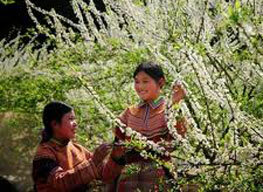 Today you will meet people from Lu minority whose population is just about 5000. Some old Lu men said that their ancestors came to settle in the region from Laos many years ago and they adopted rice farming style of the Thai while maintaining their traditional culture which reveals on women’s clothes and jewelry and still keep dying their teeth black. 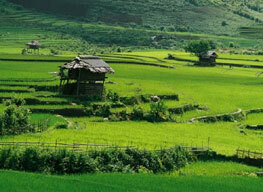 The 60 km drive from Binh Lu to Sa Pa offers the most spectacular scenery in Vietnam for sure. It is hard work to driver because beautiful landscapes makes you wish to stop at every corner while going up steep road! Arriving in Sa Pa in the afternoon, you will spend the rest of the day wandering around the narrow and busy old street of this famous tourist destination. 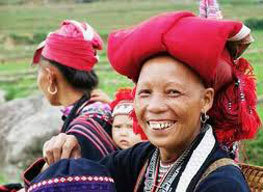 Most other tourists come from Hanoi will be anxious for trips to explore tribal villages around Sapa town but not you! Because these trips can not compare with what you had experienced so far. So the plan today is set open for your flexibility. However we suggest a morning trip to visit Lao Chai and Ta Van to admire scenery of Muong Hoa Valley, the most beautiful one from the east side of Fansipan. 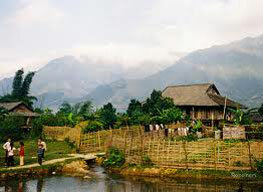 Car and guide will pick you up at hotel and drive 12 km to the center of the valley where you will enjoy an easy walk along the river, paying visit to Black H’mong and Zay villages for about 3 hours. Drive back to hotel and free to relax. Late afternoon, you will pick up for a road transfer downhill to Lao Cai station for taking the overnight train to Hanoi, which arrives early next morning. Pick up and transfer to your hotel in Hanoi. 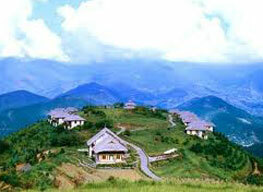 • Accommodation: 4 nights home stay at villages, 3 nights in hotel and guesthouse as stated.